Today in Masonic History William Forbes, 6th Baronet is born in 1739. 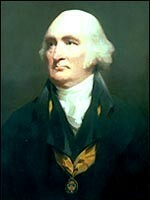 William Forbes, 6th Baronet was a Scottish banker. Forbes was born on April 5th, 1739 in Edinburgh. When Forbes was 4 years old his father passed away. Prior to his father's passing both branches of Forbes family had fallen on hard financial times and estates owned on both sides of the family had been sold off or seized. Forbes mother moved the family, Forbes and his younger brother, to Aberdeen in 1745. She moved to Aberdeen with the hopes of giving her sons an education. In 1749, Forbes' younger brother passed away. At that time Forbes' mother moved to Edinburgh. In 1754, a family friend arranged for Forbes to work as an apprentice with Coutts & Co. a prominent banking firm in Edinburgh run by two brothers. He would work as an apprentice for four years. After the apprenticeship he clerked in a counting house for another two years, after which he was offered a small share in the business as a partner. In 1761, the managing partner of Coutts & Co. passed away and there was no one left from the Coutts family to run the firm. In 1763, it was proposed that a new partnership be created. This time with Forbes in charge. Although the Coutts name would remain until 1773, the firm would eventually be called Forbes, Hunter, & Co. As the head of the new firm, Forbes decided to confine all transactions for the house to banking. The house would become one of the most trusted financial institutions in Scotland. It was one of the few financial houses that remained stable during the panics and financial crises of 1772, 1788 and 1793. In 1838, the firm became the Union Bank Company. Forbes took an interest in Government and in 1783 took part in preparing the revised Bankruptcy Act. He was also consulted by William Pitt in 1790 with suggestions on the stamps on bills of exchange. In 1799 Pitt offered Forbes an Irish peerage, Forbes refused. He also declined an invitation to stand for Parliament. Forbes in later years worked to win back some of the alienated properties of his family. After gaining control of one of the family estates he made improvements and laid out the village of New Pitsligo in 1783. He would also be involved in philanthropic projects in Edinburgh including the High School, the Merchant Company, the Morningside Lunatic Asylum and the Blind Asylum. Forbes passed away on November 12th, 1806. Forbes was the Grand Master of the Grand Lodge of Scotland from 1776 to 1778.